Akhtar Imam was born in old Dhaka on the 30th of December 1917, during the British Raj and the year of the Russian revolution. She grew up amidst a family of conservative Muslims who valued education within the code of religion, and unlike her peers, she graduated with honours in Philosophy from Bethune College, University of Calcutta, India. She was awarded the "Gangamoni Devi Gold Medal" in 1937. Adverse and critical comments, particularly from the conservative Muslim society, of that era failed to sway the 25-years-old premature widow, with three young daughters under the age of five to nurture alone, from her determined and chosen path. She remained resolute and undaunted by the enormous challenges ahead. Her indomitable courage, vision and mission propelled her towards her future development. Self- confidence, extraordinary academic talent and her determination fuelled her great heights of achievements. She became a legend in her lifetime due to the fruition of her enterprising and leadership talents. 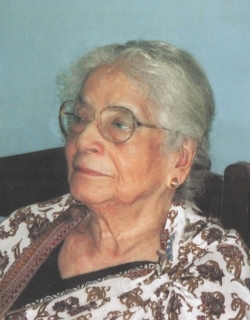 Her professional life began at Eden Girls School and College in Dhaka as assistant teacher to lecturer in the mid 1940s. She gradually became professor and worked there till February 1956. 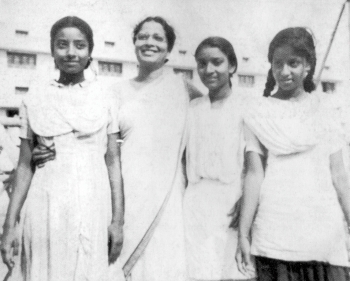 The emphasis on education encouraged her to gain a Masters in Philosophy from the University of Dhaka in 1945, whilst teaching and being a devoted mother to her three young daughters. She was awarded the only annual scholarship, from the Muslim Education Foundation, competing against men and women across undivided India to pursue postgraduate studies in the UK. She gained her M-Phil in Philosophy from University of London in 1952, under the tutelage of Professor A J Ayer and Dr S V Keeling. A devoted single parent, daughters accompanied her to London in 1950 and were privileged to have experienced such an exceptional opportunity. Her insatiable thirst to enhance more knowledge, lead her to work as a Research Fellow at the Department of Philosophy of University of Nottingham under Professor Hampshire between 1963 and 1965. 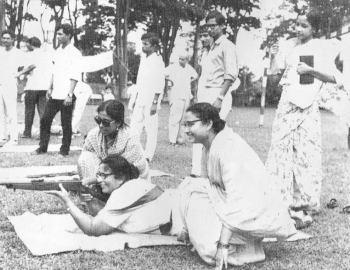 As Provost of Dhaka University during a shooting competition. Imam with her three daughters, 1954. On the 1st of March 1956, she became the first woman Professor and Head of Department of Philosophy in the famed Dhaka College for Boys. Her fortune blossomed further when she was appointed, by special invitation, to the post of the first provost of the first ever Woman's Hall, later renamed as Ruquayah Hall, of the University of Dhaka. She was also selected as Reader in the Department of Philosophy in 1956. It is important to note that she had already been appointed as part-time lecturer and was the first woman teacher at the Department of Philosophy. Perhaps one of the most rewarding features of her life as an educationist was the appreciation of international dissemination of ethics and moral philosophy, by her past students. Her enthusiasm and passion for promoting education and particularly study of Philosophy was highly appreciated and in 1968 she was elected as the first female General President of the Pakistan Philosophical Congress at its 15th session. After birth of Bangladesh in 1971, she was the first convener of the Presidium of the Bangladesh Philosophical Society and later member of the Bangladesh Philosophical Congress. She gained international recognition in various countries. She received invitations from UNESCO in 1953 and attended an international conference in New Delhi; the American State Department to visit educational institutions of distinction in 1959; the British Council to visit various eminent UK educational establishments in 1962. In further recognition her achievements and contributions to society as an educationist, social trendsetter and author from the Government of Bangladesh had conferred upon her the prestigious national award-Ruquayah Padak-2002. Her keen literary interest culminated in her becoming the President of the Bangladesh Women Writers Association for three years. During her lifetime, she wrote numerous essays varying from critical observations of social practices to witty articles – her autobiography, in three volumes, the first of which has been translated into English, as well as twelve other books, mostly in her mother tongue Bengali and a few in English. In February 1991, she felt the absence of organisations for professional woman over the age of fifty and this motivated her to establish 'Hemantika', an organisation that engaged members actively in a social, educational and cultural support group. It was her energy, leadership and intense fundraising that finally culminated in the dream creation of an Oasis for Hemantika's own bungalow, in the outskirts of Dhaka. She was elected as the 'Life President' of this organisation and on the strength of her goodwill and legacy it is flourishing to this day. Sadly in June 2009 the glow of her life finally extinguished at the age of 91. Although physically frail towards the end, mentally she remained highly spirited, dynamic and productive; her last book was published in late 2008. She conducted herself with great dignity and decorum, wit, displayed a tremendous sense of humour and was an inspiration to others. Perhaps this was what attracted a constant stream of visitors at her doorstep. Women and men of all ages would flock to her rambling residence which was her sanctuary. Discussions revolved around ethical and moral dilemmas such as surrogacy and euthanasia, and other issues affecting the future of the fast changing world. All her life she was furiously independent which was her pride and remained so till the end. On the 30th of October 2011, Akhtar Imam was laid to rest and her name was etched on the Wall of Honour at the Royal Society of Medicine in London.